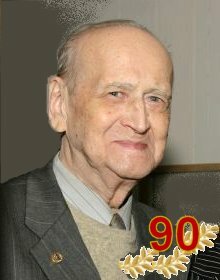 his 90th birthday on 28 May 2007. His pioneer works have made a great contribution into the cosmic ray physics and neutrino astrophysics, both experimental and theoretical ones. In the early fifties of the 20th century he understood the nuclear nature of the extensive air showers (EAS) and created the famous equations for particle propagation through atmosphere. His famous "next generation principle" assumes that the characteristics of secondary particles produced in nucleon-air nucleus interactions depend only on the portion of energy taken away by a secondary particle (this effect was found later in experiments on accelerators and was named "scaling"). The well known GZK effect (published in the seventies) is today a subject of tremendous experimental and theoretical studies all over the world. Professor Zatsepin is a pioneer who put ideological, theoretical and experimental basis for those researches in neutrino physics and astrophysics that have been realized in many experiments throughout the world by now and are planned to be performed in future. He is one of the leaders of that great Russian-American Ga-Ge experiment SAGE on study of solar neutrino flux which is already 15 years under way at the Baksan Neutrino Observatory. Zatsepin was the first to suggest measuring experimentally neutrino flux from collapsing stars. He was one of the leading figures in construction and exploitation of first set ups for the following studies: Baksan neutrino telescope and 100 ton scintillator detector in Artyomovsk in the USSR and Italian-Russian LSD in Mont Blanc. He is still one of the heads of the LVD experiment in Gran Sasso. Professor Zatsepin participated in creation of MSU roentgen-emulsion detector and the international collaboration "Pamir": Under his many-year leadership these experiments performed studies of nuclear interactions at very high energies. The analysis of the early experiments on atmospheric neutrinos which was made in one of his works in the seventies allowed him to publish a brilliant idea to use neutrino flux for direct study of matter distribution along the Earth's diameter. For a long time Professor Zatsepin has been the head of the cosmic ray chair of the physics department of Moscow State University. As the head of the neutrino physics and neutrino astrophysics department of the Institute for Nuclear Research of RAS he created a brilliant school of physicists working in the field of cosmic ray and neutrino physics. and wish him many bright and fruitful days!